Qatar, the world's wealthiest country, is known for its opulence and may soon be for its mandatory first-rate surveillance systems. While many countries struggle with low quality, antiquated systems, Qatar seems intent on making every business in the country have world class surveillance. Indeed, recently, the government took control of specifications. In this post, we review the details and share experiences from an integrator with first-hand experience working under the country's new laws. In 2011, Qatar, created a Security Systems Department to regulate and oversee all security operations throughout the country. Last week, the agency launched a new website, which for the first time puts all of Qatar's government-mandated surveillance specs online. For Qatar, it's not just about upgrading surveillance, the country also sees it as a national defense initiative, even requiring some cameras and control rooms to be accessible through the National Command Center. WDR, auto-iris and analytics required. Infrared cameras must be used in dark areas. Recordings require an audit trail. Operators are prohibited from monitoring more than nine cameras on a monitor and limited to eight hour shifts. The systems must have a minimum of one hour back up power. The system must have service agreements in place for cleaning, repair, maintenance, upgrades and fitness checks. Additionally, control rooms must be monitored around the clock, year round and operators are limited to eight-hour shifts. Before any construction can start, a company must submit blueprints, schematics and a proposal for its planned surveillance system to the Qatari Ministry of the Interior for approval. Our source learned through experience that there is almost no wiggle room in the new laws. However a few rare exemptions exist. For example, cameras must be IK-10 certified, but there is an exemption for the AXIS Q6035-E, which is IK-09 rated "they said it is close enough to IK10." 1.3 MP is listed as a requirement, but AXIS cameras are approved at 1.2. These exemptions may apply to comparable brands, he said. Once a building is completed it is inspected, and if it is not up to code, businesses can be banned from opening for a year and subject to fines. Most government databases in Qatar are linked so problems with a surveillance system can have impacts across services. 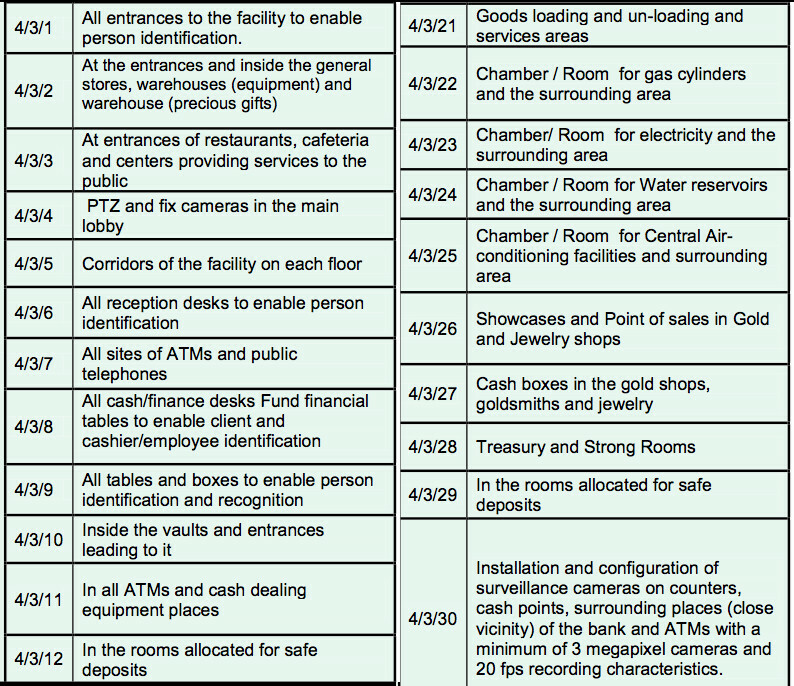 For example, one hotel is blocked from issuing tourist visas until its CCTV system is up to code. The same goes for renewing business licenses and billboard permissions. For those companies looking to participate in this 'gravy train', be warned that Qatar has restrictions on who can own and work at security integrators. It will not be easy or simple to set up business there. However, manufacturers of higher end products may want to step up marketing efforts to local, approved companies. Selling is easier because there is little need to convince clients about adding extra cameras, or buying higher quality. Some think the new laws will help get rid of bad equipment and cheap integrators. Because integrators are subject to ratings from the MOI (based on their design plans), trying to cut corners or submitting plans with technical problems can result in an integrator being banned from the CCTV business for a year. “Before the new laws ... the market was filled with cheap installers and the main contractors who issue CCTV bids simply wanted the cheapest,” our source says. “I installed systems I loathed simply because the tender specs out garbage equipment.” With the new laws, he says he works on higher quality, more enjoyable projects. Camera counts must be radically expanded, as the coverage requirements are very strict and broad. For example, a 150 camera deployment more than tripled after the requirements were released. Businesses have had to rip out existing, working systems to get up to code, because of the prohibition of IP-over-coaxial and analog systems as well as the requirement for megapixel. Less than a month after finishing a hotel surveillance system that used analog cameras with "cheap" DVRs, the Ministry of the Interior mandated the new specs. Within weeks, an integrator was rehired to install a new system that would meet government specifications. While we doubt this is a template for many other governments, this is certainly a fascinating case. What Qatar is mandating as a minimum requirement meets or exceeds what is used even in most of the wealthiest multi-national corporations.